Serves: Depends on how many veggies you slice! dry when purchased and are often times found in the noodle isle. A Large bowl of very cold water. as the Sriracha with the rooster on it.) Better yet make your own! I got my recipe from The Joy of Pickling by Linda Ziedrich. Stir it all together, and that's the sauce! 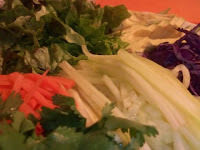 Get all your veggies prepared and arranged on a plate, so that it is easy to assemble the rolls quickly. Submerge a wrapper in the ice water until it begins to soften (about 1 minute). Remove the wrapper from the water and lay flat on your work surface (a cutting board works best for me). Dab a row of sauce down the middle of the wrapper, starting and ending about an inch from the ends. Line up your veggies, herbs and tofu down the middle of the wrapper (again about an inch from each end). 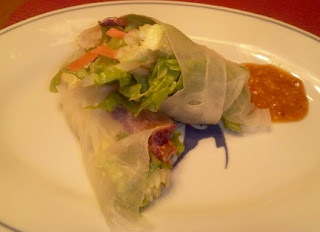 Fold in the short ends over the veggies and roll up like a skinny burrito. Place on a plate and move onto the next roll. The rolls are a little better once they have rested for a few minutes because most of the excess water on the wrapper will have been absorbed or evaporated. Serve with extra sauce on the side. Don't overload your rolls. It makes it really hard to roll up. Don't under fill your rolls. It makes them look like sad, emaciated people who only wish they were eating spring rolls. Plus, they tend to fall apart when under filled. Don't soak your wrappers for too long. They get too slippery, are hard to manage and tear easily. It's okay if the wrapper isn't 100% soft all the way through. It will soften more as the roll sits and the excess water is absorbed.